RED HEART® Stardust™: 1 ball each 1805 Blue A and 1623 Green B. Size: One size fits most. Hairnet circumference at lower edge: 24” wide. GAUGE: 16 dc = 4”; 8 rows = 4”. CHECK YOUR GAUGE. Use any size hook to obtain the gauge. NOTE: Hat is worked from center to brim. dtr (treble crochet): Yarn over 3 times, insert hook in st, draw up a loop (5 loops on hook), [yarn over and draw through 2 loops] 4 times. dtr2tog: *Yarn over 3 times and insert the hook in next st, [yarn over and draw through 2 loops] 3 times; repeat from * once more, yarn over and draw through all loops on hook. With A,ch 6, slip st in first ch to form a ring. Round 1: Ch 5 (counts as tr here and throughout), work 19 tr in first ch, slip st to top of beginning ch – 20 tr. Round 2: Ch 8 (counts at dtr and ch 3), [dtr in next tr, ch 3] 19 times, slip st in 5th ch of beginning ch – 20 spaces. Round 3: Slip st in first ch-3 space, ch 5 (counts as dtr here and throughout), dtr in same space, ch 6, [dtr2tog in next ch-3 space, ch 6] 19 times, slip st in top of beginning ch. Round 4: Slip st to center of first ch-6 space, ch 1, sc in same space, [ch 8, sc in next ch-6 space] 19 times, ch 4, tr in first sc (counts as ch 6 space and sc) – 20 ch-6 spaces. Round 5: Ch 1, sc in same st, ch 9, [sc in next ch-8 space, ch 9] 19 times, slip st in first sc. Round 6: Ch 1, sc in same st, ch 10, [sc in next ch-9 space, ch 10), slip st in first sc. Round 7: Ch 3, (counts as dc here and throughout), *9 dc in next ch-10 space, dc in next sc; repeat from 18 more times, 9 dc in last ch-10 space, slip st in first sc – 200 dc. Fasten off. Round 8: Join B in any st, ch 3, dc in each dc around, slip st in top of beginning ch. Rounds 9-10: Ch 3, dc in next 2 dc, *ch 2, skip 2 dc, dc in next 3 dc; repeat from * to last 2 dc, ch 2, skip 2 dc, slip st in top of beginning ch. Round 11: Ch 3, dc in each dc and ch around, slip st in top of beginning ch. Round 12: Ch 3, dc in next 7 dc, *skip next dc, dc in next 5 dc; repeat from * around, slip st in top of beginning ch – 167 dc. Round 13: Ch 2, hdc in next st, *skip next st, hdc in next 4 sts; repeat from * around, slip st in top of beginning ch – 134 hdc. Round 14: Ch 2, *skip next st, hdc in next 3 sts, skip next st, hdc in next 2 sts; repeat from * 18 more times, slip st in top of beginning ch – 96 hdc. Round 15: Ch 3, dc in next 2 hdc, *ch 1, skip next 2 hdc, dc in next 3 hdc; repeat from * around to last st, skip last hdc, slip st in top of beginning ch. Round 16: Ch 3, dc in each dc and ch-1 space around, slip st in top of beginning ch. Fasten off. With 1 strand of A and B held together, ch 150, Fasten off. 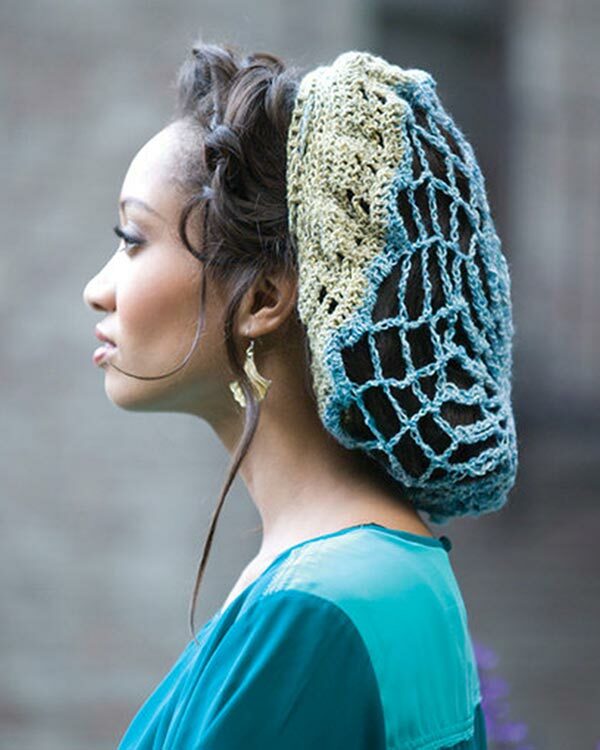 Beginning and ending at back of Hair Net, weave Drawstring Tie through ch-1 spaces of Round 15. *or** = repeat whatever follows the *or** as indicated. 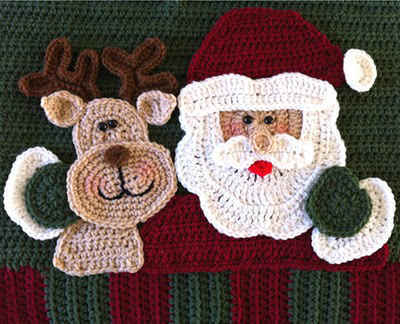 Santa Pillow Crochet Along – Finished Pattern!! !